The red and orange and gold leaves are gone, turned to crumpled brown paper. Now, in the dark days of winter, the evergreen trees come into their own. They’ve been there all along, of course, hidden by autumn’s lavish foliage. Now the green shines amid the bare branches. The spruces create a geometric shape, a long, narrow triangle against the skyline. 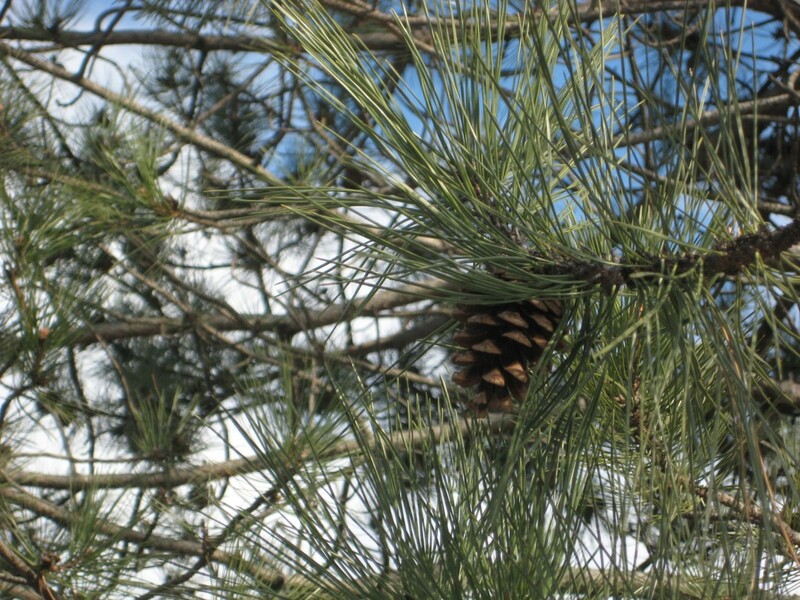 Pines are ragged, unsymmetrical, lovably awkward. On north-facing slopes, graceful hemlocks shade the hillside. Sometimes the trees are frosted by snow, sometimes they sing in the wind. But the main thing about evergreens is that they’re well, green. Ever green. Or, not really. Nothing lasts forever, of course. The tree itself can endure for centuries, but the leaves have a much shorter lifespan. (They’re shaped like needles, but structurally they’re considered leaves.) 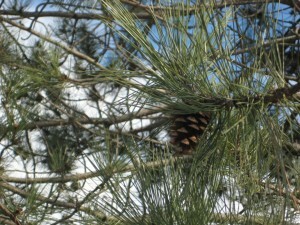 An individual pine needle, for example, lives three years or so, then turns a sickly yellow and falls off the branch. But evergreen trees keep at least some of their leaves green all winter, which means that they retain the chemical called chlorophyll in their tissues. Which means that the plants are making food—actively photosynthesizing, going through the processes of life, even in the “dead” of winter. This is an incredibly important adaptation for plants that live where the sunlight is scarce, the cold is fierce, and the snow is deep. Water has to be available for photosynthesis to happen. 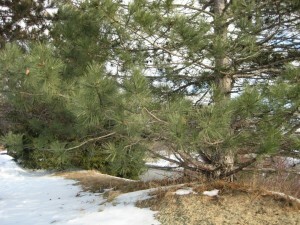 The needle shape of most evergreen leaves allows evergreens to conserve water. As cold, dry winds blow across a flat surface, they rob it of moisture (as we can feel on our chapped hands and lips.) The thin, narrow leaves help the tree hoard water. The needles have a waxy coating that also helps keep moisture from evaporating—botanical chapstick, so to speak. Nothing looks quieter and more serene than an evergreen tree in a winter landscape. But even while standing motionless under an overcoat of snow, a spruce or fir or pine or cedar is busily working, capturing any stray gleam of sunshine to use in the food-making process called photosynthesis. Sunlight, even a pale winter ray, is the start to this process, the key that turns the engine, so to speak. Only a small trickle of light can penetrate the snow, like the gleam of a candle in a dark room. But that’s enough sun to trigger the light-sensitive cells and begin the long chain of chemical reactions that occurs in every green leaf, turning air and water into sugars that nourish the plant. As you walk under evergreen boughs, remember you’re not the only living thing in the stark winter landscape. Those quiet trees are churning with life.